Here are some basics for making and designing your very own decorative leather pins. The front of the pin can be made large enough so that some shapes, like fish and birds, are possible to make. With some creativity and imagination you can make some beautiful decorative pins. This is a great craft for Summer Camp or a group activity at school. This craft requires parental assitance and supervision. (Parental Assistance and Supervision Required) Design the face of the decorative pin first with some of the cowhide leather. 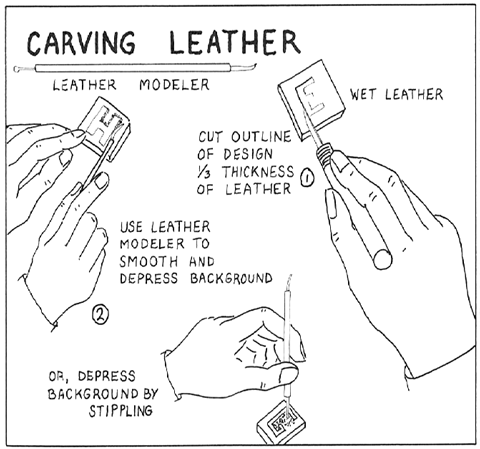 Cut the outline with sharp end of leather modeler. After cutting the outline, wet but do not soak the leather with water. Mark the outline of the design faintly with the small end of the leather modeler. Remember any marks made on wet leather will be there when the leather dries. This part, an adult will need to help you with. [Ask the adult to do the following ... using the point of a sharp knife, cut in the design to a depth of about one-third the thickness of the leather. Hold the knife perpendicular to the leather surface.] Push and model the background of the design with the leather modeler, compressing the background so that it is lower than the main design, and so makes the main design stand out. Another way to depress the background is by stippling—making small dents all over the background with the small end of the modeling tool. Make the pinbacks of glove leather or vinyl with two slits to let the safety pin poke through. Cut the pinback leather after the face is finished, so that the proper size can be cut, and the right sized safety pin inserted. Cement the pinback to the facing. 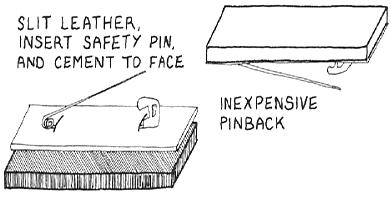 Though pinbacks are available at low cost ( three cents each and up) in craft stores, this sort of pinback is stronger, since the cemented surface is greater.